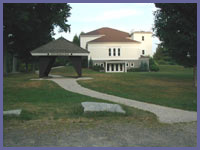 White Memorial is located in Litchfield just off Rt. 202. It's a 4,000 acre private preserve with at least 35 miles of trails and to explore. Although a great place to hike, the main purpose of the preserve is for conservation, education, research, and recreation. The main entrance area has a museum/education center, picnic tables, and open fields for those interested in spending a relaxing day. An open air canopy with large maps and brochures makes it easy to plan out a nice hike. It's best to stop in here in you're not familiar with White Memorial. The place is huge and it's easy to get lost if you venture out on your own without proper planning. White Memorial has a wide variety of plant and animal life. If you're into botany or birds, this is your place. 600 acres are designated "natural area". This means that nature grows uninterrupted and protected from man. The trails interact with this acreage in a way that allows the "viewer" to appreciate the preserve and maintain the integrity of natural areas. White Memorial has swampland, forest, open fields, vistas, ponds, rivers, streams, and a lake. You can hike, canoe, fish, camp, learn, and explore. A couple of large bird cages behind the museum house owls and hawks that are being rehabilitated for future release. This presents the chance to get close up to creatures you rarely see wild). If you're an early riser and can get there as the sun comes up it's quite possible to see a red fox traipsing through an open field. Deer, rabbit, woodchucks, chipmunks, owls, and beaver are abundant but you need to stay quiet or still sometimes to see them. If you travel a side trail that follows a river or pond, don't be surprised if a beaver comes out to greet you in his own special way. He'll smack his tail into the water and soak you from head to toe if you don't respect his space. It's his way of saying, "If you're a beaver lookin' for a place to live...don't even think about it! I own this joint." Try to get out and explore White Memorial as you're guaranteed at least one unique experience. All in all, White Memorial (http://www.whitememorialcc.org) is a can't-miss place. to find out about guided hikes and other great activities available to individual hikers and families. Directions: White Memorial is located 20 -25 miles north of Danbury,CT. on Route 202. Take Rt. 202 north through New Milford, Marbledale, and Bantam. As you leave Bantam on 202 you go over a small crest with a Catholic church on the right. It's bright white clapboard siding and golden cross make it a noticeable landmark. Proceed another few miles and you'll see Wamogo High School on the left. The entrance to White Memorial is just up the road on the right hand side. Take a right on Bissel Rd. and then an immediate right onto Whitehall Rd. It's a gravel road with some potholes so go slow. Follow this road all the way to the main area with museum and picnic area.